Oifigeach Gearmánach de phór uasal ab ea Claus Schenk Graf von Stauffenberg (15 Samhain 1907 - 21 Iúil 1944), a d'fhéach le hAdolf Hitler a mharú ar an 20 Iúil 1944. Theip an iarracht air, agus cuireadh chun báis go gairid ina dhiaidh sin é.
Rugadh Stauffenberg do lánúin de phór uasal Chaitliceach i Jettingen in aice le hUlm sa Sváib. Bhí sé ar an bhfear ab óige de thriúr deartháireacha: Berthold agus Alexander a bhí ar an mbeirt eile. Fuair Claus óg oideachas maith, agus féith na litríochta ann féin, ach sa deireadh, chuaigh sé sna saighdiúirí. Cosúil le go leor saighdiúirí de phór uasal, roghnaigh sé reisimint cháiliúil an mharcshlua i mBamberg, in éineacht lena dheartháireacha. Ansin a fuair an triúr fear acu aithne ar an bhfile Stefan George agus ar lucht a leanúna. Cé go raibh luiteamas ag na polaiteoirí cultúrtha Naitsíocha le filíocht George, ionas gur ghair siad file náisiúnta de nuair a fuair sé bás sa bhliain 1933, is iomaí duine de lucht a leanúna a d'iompaigh in aghaidh Hitler sa deireadh. Sa bhliain 1929, bhain Claus óg amach céim an leifteanaint. Sa bhliain 1933, chuaigh Hitler i gceannas ar an nGearmáin, agus tháinig na Naitsithe i gcumhacht. Bhí Claus von Stauffenberg idir dhá thine Bhealtaine. Chuir cuid d'idé-eolaíocht na Naitsithe samhnas air, ach bhí bá aige le Náisiúnachas na Naitsithe. Sa bhliain 1933, shínigh an Eaglais Chaitliceach concordáid le Hitler le stádas na hEaglaise sa Ghearmáin a chinntiú, ach níor thug na Naitsithe urraim ar bith don choncordáid ina dhiaidh sin. Bhí na heaspaig ag casaoid faoi dhímheas na n-údarás Naitsíoch i leith na concordáide, agus faoina dtionchar sin, d'eisigh an Pápa an tréadlitir cháiliúil Mit brennender Sorge, inar cháin sé ciníochas agus íoladhradh na Naitsithe. Chuaigh an tréadlitir go mór i gcion ar Stauffenberg. Thairis sin, ní raibh sé ábalta an drochíde a sheasamh a bhí na Naitsithe a thabhairt do na Giúdaigh go hoscailte. Bhí Stauffenberg ag déanamh síor-dhul chun cinn mar shaighdiúir, agus nuair a d'ionsaigh na Gearmánaigh an Pholainn, ghlac sé páirt san fheachtas. San am seo, bhí céim an Rittmeister aige - is é sin, "máistir marcaíochta", nó captaen marcshlua. Mar sin féin, bhí a choinsias ag luí air, agus nuair a mhol deartháir a mháthar, Nikolaus Graf von Üxküll, dó dul i ngluaiseacht na frithbheartaíochta, bhí an-chathuithe air. D'áitigh Peter Yorck von Wartenburg agus Ulrich Wilhelm Graf Schwerin von Schwanenfeld air post an aidiúnaigh a bhaint amach ag Walter von Brauchitsch, a bhí ina Ard-Cheannasaí ar fhórsaí armtha na Gearmáine san am, le go mbeadh seans aige Hitler a mharú. Dhiúltaigh Stauffenberg, áfach, nó cosúil le saighdiúirí na Gearmáine go léir, bhí sé tar éis dílseacht a mhóidiú do Hitler go pearsanta. Ní fhéadfadh oifigeach uasal den tseanphór a mhionna a shárú chomh héasca sin. Rinneadh atheagrú ar aonad Stauffenberg, agus fuair sé é féin ar fhoireann ghinearálta an tSéú Rannán Tancanna, rannán éadrom tancanna de chineál nua a bhí ceaptha le reicí tír-raoin a dhéanamh, cosúil leis an marcshlua. Ghlac an rannán seo páirt i bhfeachtas na Fraince sa bhliain 1940, rud a thabhaigh Cros Iarainn den chineál ab fhearr do Stauffenberg. San am seo, bhí urraim ag Stauffenberg do Hitler i gcónaí. Tháinig port eile aige, áfach, nuair a thosaigh Oibríocht Barbarossa, an t-ionsaí ar an Aontas Sóivéadach. An ródach míréasúnta a chuaigh ar na Rúisigh agus ar na Giúdaigh, chomh maith leis an dóigh a raibh droch-cheannasaíocht Hitler ag teacht chun solais agus an cur chuige a bhí aige i gcúrsaí cogaíochta, d'fhág siad an t-imprisean ar Stauffenberg nach raibh sé ag cur catha ar son aon dea-chúis a thuilleadh, má bhí riamh. Sa bhliain 1942, ghlac Stauffenberg leis gur chóir an chumhacht a bhaint de Hitler le lámh láidir. Bhí sé suite siúráilte gurb iad na fórsaí armtha - an Wehrmacht - an t-aon fhórsa a bheadh ábalta deireadh a chur leis an deachtóireacht agus an ceann is fearr a fháil ar dhíormaí armtha na Naitsithe, ar nós na bpóilíní polaitiúla (Gestapo), an SS agus na seirbhíse slándála (SD). Rinne Stauffenberg iarrachtaí an nimh a bhaint de pholasaí na Naitsithe sa chuid den Aontas Sóivéadach a bhí forghafa ag na Gearmánaigh. Chuir sé in aghaidh an Kommissarbefehl, is é sin, an t-ordú a chuir de dhualgas ar na saighdiúirí Gearmánacha na feidhmeannaigh Chumannacha a chur chun báis ar an toirt, agus bhí sé meáite ar chruachás na gcimí cogaidh a mhaolú ar dhóigheanna eile fós. Ní raibh an tAontas Sóivéadach tar éis conradh na Ginéive a shíniú, agus mar sin, ní raibh aon cheangaltas ar na Sóivéadaigh caitheamh leis na cimí Gearmánacha de réir an dlí idirnáisiúnta. Mar sin, bhí sé de chlaonadh sna Gearmánaigh gan a gcloigne féin a bhuaireamh mórán faoi chúis na saighdiúirí Sóivéadacha a bhí cimithe acu féin, ach an oiread. Bhí a fhios ag Stauffenberg an méid sin, agus mar sin, d'eisigh sé treoirlínte dá chuid féin le féachaint chuige nach gcaithfí go mídhaonna leis na cimí. Sa bhliain 1942, bhí Hitler díreach i mbarr a chumhachta. Bhí an chuma ar an scéal go raibh sé ar tí an Cumannachas a chur de dhroim an tsaoil, agus mar sin, bhí luiteamas ag cuid mhaith daoine leis nach raibh ina Naitsithe ar aon nós, ó bhí eagla ar go leor roimh an gCumannachas. Mar sin, thuig Stauffenberg agus a chuid deartháireacha nárbh é sin an t-am ceart le Hitler a mharú. Idir an dá linn, bhí siad ag coinneáil caidrimh le go leor daoine éagsúla a bhí in aghaidh Hitler, idir iar-cheannasaithe Airm ar nós Erich Hoepner, agus Ciorcal Kreisau, arb é an dream ba chuimsithí de chuid an fhreasúra rúnda. Fuair na deartháireacha aithne ar Dhaonlathaigh Shóisialta a bhí gníomhach i saol an fhreasúra, agus chuaigh a ndearcadh polaitiúil féin chun caoinfhulangachta. Bhí siad sásta glacadh leis go mbeadh ról tábhachtach ag an sóisialachas daonlathach sa rialtas a chuirfí ar bun sa Ghearmáin i ndiaidh bhás Hitler. I Mí na Samhna 1942, chuaigh na Comhghuaillithe i dtír san Afraic, agus d'ascain an Deichiú Rannán Tancanna trí dheisceart na Fraince, a bhí á rialú ag rialtas comhoibritheach Vichy faoin am seo, go tuaisceart na hAfraice. An bhliain a bhí chugainn cuireadh Stauffenberg go dtí an Afraic le dul sa rannán seo. B'ansin a goineadh go tromchúiseach é agus na heitleáin Shasanacha á bhuamáil ón aer. Fágadh ar leathshúil agus ar leathlámh é, agus níor fágadh ach trí mhéar ar an lámh mhaith féin. Cuireadh Stauffenberg abhaile go Caisleán Lautlingen i ndeisceart na Gearmáine le téarnamh a dhéanamh. Bhí sé an-mhíshásta leis, nó mura mbeadh post ar bith aige san Arm, ní fhéadfadh sé cuidiú leis an ngluaiseacht frithbheartaíochta cumhacht a shealbhú sa Ghearmáin. Ansin, rith leis na comhcheilgeoirí é a chur ar fhoireann an Ersatzheer, is é sin, an chuid d'Arm na Gearmáine a bhí fanta sa tír féin, i sráid Bendler (Bendlerstrasse) i mBeirlín. Anseo, bhí Stauffenberg ag obair don Ghinearál Friedrich Olbert, a bhí go tréan in aghaidh Hitler. Bhí an-seans ag an Ersatzheer coup d'état a chur i gcrích sa Ghearmáin, nó dá mbeadh trioblóidí inmheánacha sa Ghearmáin, agus an teagmháil le lucht ardcheannais an airm caillte, chaithfeadh an tErsatzheer an tír a shealbhú agus an tsíocháin inmheánach a chur ar bun arís. Oibríocht dhleathach go hiomlán a bheadh i gceist leis seo, plean ar ghlac Hitler féin leis. Anois, áfach, shocraigh na comhcheilgeoirí go mbainfí úsáid as an bplean seo - "Oibríocht Walküre" - nuair a bheadh Hitler marbh. Mar sin, ní fhéadfadh na Naitsithe móra eile an chumhacht a choinneáil acu féin. Ar dtús, ba é Axel von dem Bussche a bhí le Hitler a mharú. Bhí sé sásta ionsaí féinmharfach a dhéanamh agus é féin a shéideadh le dhá ghránáid láimhe in éineacht leis an deachtóir. Níor éirigh leis an bplean seo, áfach. Nuair a bhí na himeachtaí ag cúngú isteach ar na comhcheilgeoirí, b'éigean dóibh na pleananna cruinne a thréigean agus rud éigin a thobchumadh. Leis na blianta fada anuas, bhí Stauffenberg suite siúráilte go raibh rialtas Hitler coiriúil amach is amach, ach i dtús na bliana 1943, tuigeadh dó go scriosfadh straitéisí cogaidh an deachtóra an Ghearmáin féin agus go bhfaigheadh na milliúin daoine bás dá ndeasca. Cosúil le go leor daoine ina thimpeall, mhothaigh sé go raibh sé de dhualgas morálta air iarracht a dhéanamh le Hitler a mharú, ar an t-aon chúis amháin ná go bhfaigheadh an saol mór le feiceáil nach raibh iomlán na Gearmáine sásta leis na hainghníomhartha a bhí idir lámhaibh ag Hitler agus na Naitsithe. I Meitheamh 1944, chuaigh na Comhghuaillithe i dtír sa Fhrainc, agus ón lá sin i leith, bhí Stauffenberg agus na míleataigh phroifisiúnta ar fad sa Ghearmáin cinnte go raibh an cogadh caillte. Ní bua a bhí ag teastáil uaidh anois, ach sos cogaidh chomh gasta is ab fhéidir, le nach mbeadh tuilleadh fulaingte agus léirscriosta in aisce ann. Bhí a fhios go maith ag Stauffenberg go raibh sé le coir an ardtréasa a dhéanamh. Ag ceann de na cruinnithe a bhí ag an gcomhcheilg, dúirt sé le von dem Bussche scun scan: "Bímis neamhbhalbh: le teann na n-acmhainní go léir atá ar fáil dom, tá mé ag iarraidh ardtréas a chur i gcrích..." (Gehen wir in medias res: ich betreibe mit allen mir zur Verfügung stehenden Mitteln den Hochverrat...). Mar sin féin, bhí sé den tuairim go raibh "dlí nádúrtha" ann nach gceadódh coireanna Hitler ar aon nós, agus go raibh sé in áit na héigeandála ag cosaint náisiún na Gearmáine ar an tubaiste a bhí Hitler a tharraingt anuas ar an tír. Ó thús Mhí Mheán Fómhair 1943 go lá a bháis, ba é Stauffenberg ceannasaí spioradálta na comhcheilge. Fear dáigh daingean diongbháilte a bhí ann agus é ábalta an t-amhras a scaipeadh le fórsa a phearsantachta. Le cuidiú ó Henning von Tresckow, chuir sé eagar ceart ar na comhcheilgeoirí agus spreag sé chun gnímh iad. De réir na páirte a bhí ag Stauffenberg sa chéad phlean, d'fhágfaí i mBendlerstrasse é, áit a bhféadfadh sé glao ar an teileafón ar aonaid an airm agus áitiú orthu baill na n-eagraíochtaí polaitiúla Naitsíocha a cheapadh agus a chimiú. Ar an drochuair, tháinig sé chun solais go gcaithfeadh sé dhá thrá a fhreastal. Ní raibh cead isteach ag aon duine eile de na comhcheilgeoirí ar chruinnithe pearsanta Hitler, agus thairis sin, b'eisean an t-aon duine amháin acu a raibh aithne aige ar an gcuid ba mhó de na hoifigigh arda, ionas go mbeadh sé in ann a áitiú orthu an chumhacht a bhaint de na Naitsithe. Mar sin, thoiligh Stauffenberg Hitler a mharú é féin. I ndiaidh iarrachtaí éagsúla nár éirigh leo agus nach bhfuair Hitler amach fúthu, d'fhéach sé le Hitler a mharú le buama le linn cruinniú i Wolfsschanze nó Pluais an Mhic Thíre sa Phrúis Thoir in aice le Rastenburg (inniu, Kętrzyn sa Pholainn) ar an 20ú lá den Mheitheamh, 1944. Bhí sé ag iompar dhá bhuama beaga ina mhála cáipéisí, agus amadóirí ceimiceacha leo a phléascfadh i gceann deich nóiméad nó cúig nóiméad déag iad. Ba nós le Hitler a chuid cruinnithe a choinneáil thíos sa bhuncar, ach inniu, ní raibh eitleáin na gComhghuaillithe ag ionsaí, agus mar sin, baineadh úsáid as bothán adhmaid in áit an bhuncair. Istigh ar an leithreas dó, thosaigh Stauffenberg ag armáil na mbuamaí, ach fuair sé deacair an obair a dhéanamh agus é fágtha ar leathlámh, go háirithe nuair a bhí duine éigin ag cnagadh ar an doras agus á dheifriú, ó bhí an cruinniú díreach ar tí tosú. Mar sin, níor fágadh ach aon bhuama amháin ag ticeáil. D'fhág Stauffenberg an buama eile ag a chúntóir pearsanta agus chuaigh sé isteach sa seomra cruinnithe gan ach aon bhuama amháin sa mhála cáipéisí aige. Chuir sé an mála cáipéisí faoin mbord in aice le Hitler agus d'imigh sé faoi dheifir, agus é ag rá go gcaithfeadh sé glao teileafóin a chur ar dhuine éigin i mBeirlín. D'fhan Stauffenberg i bhfolach i gcóngar don bhothán, go dtí go bhfaca sé an buama ag pléascadh. Stróiceadh an bothán adhmaid as a chéile, agus daoine á séideadh san aer ag an mbrúthonn. Mar a chonacthas do Stauffenberg, ní fhéadfadh aon duine teacht slán as a leithéid. Mar a thiontaigh an scéal amach, áfach, ní raibh Hitler marbh. Ní raibh sé, fiú, gonta go ródhona, cé gur básaíodh a lán eile de na daoine a bhí i láthair. Bhí an dearg-ádh leis, agus na himthoscaí ag fabhrú dó. Dá mbeadh an dá bhuama ann, in áit aon cheann amháin, dá mbeadh an cruinniú ar siúl thíos sa bhuncar in áit an bhotháin, - ba leor aon cheann amháin de na coinníollacha seo a bheith comhlíonta, lena chinntiú go mbeadh port Hitler seinnte. Thairis sin, bhí an bord láidir darach ina sciath chosanta idir Hitler agus an buama. Iad siúd nach raibh ina suí in áiteanna chomh sábháilte céanna, fuair siad bás nó goineadh go héag iad. Plaic chuimhneacháin do Stauffenberg, Quirnheim, Haeften, Olbricht agus Beck. Anseo a fuair na fir seo leanas bás ar son na Gearmáine ar an 20ú lá de Mhí Iúil sa bhliain 1944: An Ginearál-Choirnéal Ludwig Beck; An Ginearál Cos-slua Friedrich Olbricht; An Coirnéal Claus Graf Schenk von Stauffenberg; An Coirnéal Albrecht Ritter Mertz von Quirnheim; An Leifteanant Sinsearach Werner von Haeften, a deir sé. 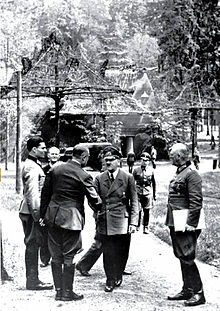 Nuair a bhí an buama pléasctha, thréig Stauffenberg agus a aide-de-camp, an Leifteanant Werner von Haeften, an áit faoi dheifir agus thug siad aghaidh ar an aerstráice. D'fhág siad an dara buama i gcoill bheag in aice leis an aerstráice agus chuaigh siad isteach ar an eitleán - eitleán buamála Heinkel He 111 - a bhí curtha i leataobh lena aghaidh go speisialta. Nuair a bhí sé ag eitilt go Beirlín, tháinig ordú ó Hitler Stauffenberg agus Haeften a chur chun báis chomh tapaidh agus ab fhéidir, ach ní dheachaigh an t-ordú sin i bhfad, ó stop duine de na comhcheilgeoirí, Friedrich Georgi ar fhoireann an aerfhórsa, é.
Nuair a thuirling an t-eitleán i mBeirlín ag a leathuair i ndiaidh a ceathair a' chlog iarnóna, bhí Stauffenberg suite siúráilte i gcónaí go raibh Hitler marbh. Anois, bhí sé in am na Naitsithe a chur ó chumhacht agus an tArm a chur i gceannas ar an tír. Tamaillín beag ina dhiaidh sin, áfach, d'fhógair Joseph Goebbels ar an raidió gur tháinig Hitler slán as an gcruachás. Ag a seacht a' chlog iarnóna, chualathas Hitler féin ar an raidió, agus tuigeadh do na comhcheilgeoirí go raibh teipthe ar an gcoup d'état go hiomlán. Tháinig lucht leanúna Hitler ar a lorg, agus gabhadh Stauffenberg agus na comhcheilgeoirí eile a bhí i mBendlerstrasse. B'é an Ginearál Friedrich Fromm ba chúis leis. Bhí sé féin sáite sa chomhcheilg, ach anois, d'fhéach sé le hé féin a shábháil, agus chuir sé ar bun cúirt mhíleata ar an toirt le Stauffenberg agus na comhcheilgeoirí eile a dhaoradh chun báis. Timpeall is uair an chloig i ndiaidh an mheán oíche, básaíodh Stauffenberg, an Ginearál Olbricht, an Leifteanant von Haeften agus an Coirnéal Albrecht Mertz von Quirnheim istigh sa chlós i gceanncheathrú an Ersatzheer i mBendlerstrasse. B'iad na focail dheireanacha a labhair Stauffenberg ná: Es lebe unser heiliges Deutschland - "go maire ár nGearmáin naofa". Thug an Ginearál Fromm ordú na comhcheilgeoirí a adhlacadh i Reilig Matthäus i gceantar Schöneberg i mBeirlín faoi onóracha míleata. Sin é an rud a rinneadh, ach ar an lá arna mhárach, thóg an SS aníos corpán Stauffenberg, bhain siad na boinn de agus dhóigh siad sa chréamatóiriam é.
Stauffenberg - Die Tragödie des 20. Juli 1944 ("Stauffenberg - an Traigéid ar an 20 Iúil 1944"). David Sternbach a scríobh an dráma seo, agus tháinig sé i gcló ón teach foilsitheoireachta úd Dieve Verlag sa bhliain 1994. Es geschah am 20. Juli ("Thit sé amach ar an 20 Iúil"). Georg Wilhelm Pabst a stiúraigh an scannán seo, agus rinneadh an léiriú i bPoblacht Chónaidhme na Gearmáine sa bhliain 1955. Der 20. Juli ("An 20 Iúil"). Scannán Gearmánach eile ón mbliain 1955. Ba é Falk Harnack an stiúrthóir. Operation Walküre ("Oibríocht Walküre"). Seo dráma doiciméadach a léiríodh don teilifís. Ba é an stáisiún teilifíse ARD a rinne é. Ba é Franz Peter Wirth a bhí ina stiúrthóir, agus scríobh Helmut Pigge an script, rud a thuill duais Adolf Grimme dó - an duais teilifíse is tábhachtaí sa Ghearmáin. Chonacthas an dráma seo ar theilifís na Gearmáine sa bhliain 1971. Die Stunde der Offiziere ("Uair na nOifigeach"). Dráma leathdhoiciméadach a bhí ann. Ba é an staisíún raidió úd ZDF a léirigh an clár teilifíse seo. Bhí sé bunaithe ar shaothar Guido Knopp, iriseoir Gearmánach a scríobh a lán leabhar soléite faoi chúrsaí an Tríú Reich. Tháinig an scannán seo ar scáileán na teilifíse sa bhliain 2004, leis an leathchéad bliain a chomóradh i ndiaidh imeachtaí an 20 Iúil. Stauffenberg le Jo Baier. Scannán teilifíse eile ón mbliain 2004 atá ann. Chuir Baier béim ar leith ar an gcoincheap Aufstand des Gewissens, is é sin, "ceannairc an choinsiasa". Bhí an staraí Peter Hoffmann, a scríobh beathaisnéis Stauffenberg, agus mac Stauffenberg féin, Berthold, míshásta leis an leagan seo, áfach, ó thug sé le fios gurbh é Henning von Tresckow a chuir in iúl do Stauffenberg nach raibh sé ag cur leis an tsibhialtacht Chríostaí na mílte Giúdaigh a mharú scun scan. 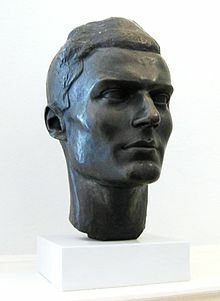 Le fírinne, bhí Stauffenberg in ann sin a thuiscint as a stuaim féin. Valkyrie, scannán Meiriceánach ón mbliain 2008. Ba é Bryan Singer an stiúrthóir, agus Tom Cruise a rinne páirt Stauffenberg féin. Scannán Béarla a bhí ann, ach i dtús an scannáin, bhí sliocht as dialann Stauffenberg le cloisteáil i nGearmáinis. Chuaigh an scannán ar an scáileán sa Ghearmáin féin, ar ndóigh, agus is é an teideal a bhí air ná Operation Walküre - Das Stauffenberg-Attentat. Fuair na léirmheastóirí Gearmánacha locht ar an dóigh ar scinn an scannán ón bhfírinne stairiúil in áiteanna, ach ón taobh eile de, bhí cuid mhaith acu breá sásta leis an léiriú. Is é an locht ba mhó a bhí acu ar an scannán ná nach bhfuair Carl Goerdeler agus an Ginearál Olbricht a gceart - dúirt Peter Steinbach ar an Hamburger Abendblatt, fiú, gur mhaslaigh an scannán Goerdeler. Ón taobh eile, fuair Steinbach a lán le moladh faoin scannán freisin. Sampla is ea é seo den fháilte mheasctha a fuair an scannán sa Ghearmáin. Maidir le Peter Hoffmann, bhí seisean i bhfad ní ba sásta leis an gceann seo ná leis an scannán a rinne Jo Baier. Tugadh an leathanach seo cothrom le dáta an 13 Deireadh Fómhair 2018 ag 08:25.